Designed to complement the handlebar and seatpost, the Fizik Cyrano R1 stem delivers incredible strength and stiffness while keeping the weight low. Made from a combination of 7075-series Ergal aluminum for high strength-to-density ratio, Anticorodal aluminum for increased durability and outfitted with titanium bolts, the Cyrano only weighs 128 grams (110mm - 7º). The Cyrano R1 Aluminum Stem come in Black and is available in 80-130mm sizes (10mm increments). 7 degree rise/drop. Light, it feels like youre holding a light bulb! Looks good, and is. I like how the torque specs are printed near the fastners. But look at it! 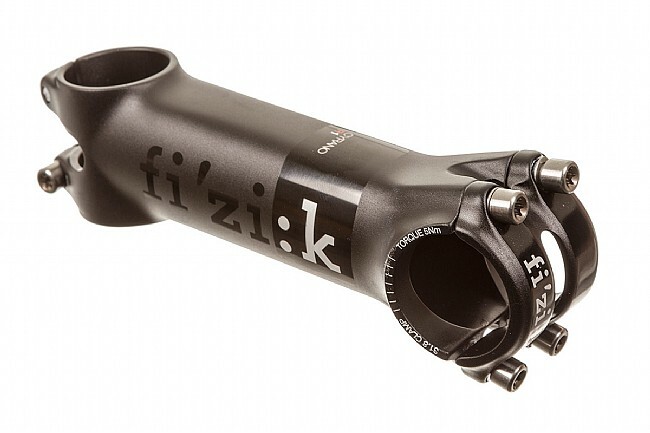 as with everything Fizik makes it is a beautiful design, light and stiff. The R1 has Titanium bolts while a slight weight advantage the beauty is it will never get any rust or strip out. The only issue for some might be that the bolts are a star head instead of a standard hex. I would recommend nothing higher than 7 NM as I have heard of people stripping the internal threads and 7 is plenty.